The SolsticeLow-Residency MFA in Creative Writing Program of Pine Manor College and the Foundation for Children’s Books (FCB) will co-host the second in a series of biannual events, “What’s New in Children’s Books,” a half-day conference featuring authors, illustrators, and library and bookstore professionals. The conference takes place Saturday, April 28 from 9 a.m.–12:30 p.m. (registration and coffee begins at 8:30 a.m.) in the Founder’s Room on the Pine Manor College campus, 400 Heath Street in Chestnut Hill. There is plenty of free parking! For directions to Pine Manor College, go to: www.pmc.edu/directions. At AWP’s recent conference in Chicago, Steve Heller, Professor and Chair of Antioch University Los Angeles’ MFA program, was elected President of AWP’s Board of Directors. He will serve from 2012 through early March 2013. Heller served as Vice President and Secretary in the years leading up to this appointment. Heller is author of The Automotive History of Lucky Kellerman, a novel, and most recently, What We Choose to Remember, a collection of nonfiction. His work has appeared in New Letters, Colorado Review, Fourth Genre, and elsewhere. Only a week has passed, yet it feels like AWP Chicago was years ago! I’m only now getting on top of things to post photos and news from the conference. 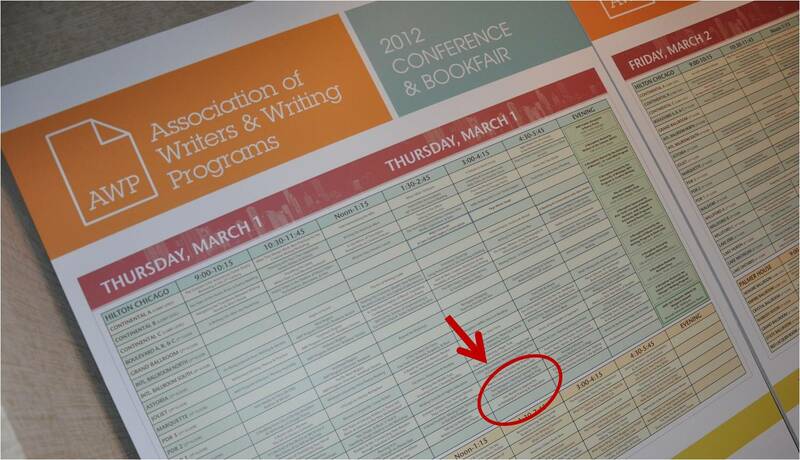 As usual, it was great to catch up with the many writers, editors, and publishers I look forward to seeing each year. I’m afraid I was not so on the ball this year and lapsed in my usual eager amount of photo-taking, but what I have will have to do. But, first, I must thank my lovely publisher Continuum Books for again providing me with a great space in the bookfair; there continues to be a nice buzz and appreciation for The Low-Residency MFA Handbook, and that just makes me very happy indeed. I was also super grateful for those who helped out at the table while also taking the opportunity to promote their own new releases: Patricia Florio and Sandee Umbach. These ladies were a godsend for when I needed to run off to a session (like my awesome panel with Danita Berg, Clark Knowles, and Jim Warner!) or needed a caffeine break. Plus, it was great to see them get some attention from book browsers! The bookfair, as usual, was a happening place despite the strange four-ballroom layout. 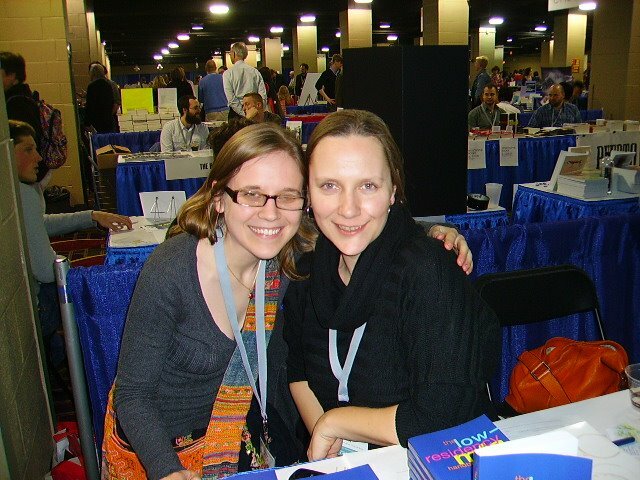 Thank goodness for table numbers so friends like Amelia Glebocki and Claudia Manley could find me and also new-to-me friends in the making, like Beth—who came to AWP all the way from Hawaii after reading my conference praise in The Low-Res MFA Handbook. Wow. Plus, she was really fun to chat with and I’m glad she was successful on her sixth try to find me at the table (she should have just checked the line at Starbucks). The evening events were stellar, again. There’s just too much to do, which is good, so I am usually happy if I can make it to one thing a night. I did make a few rounds of the receptions (thank you Red Hen Press and Chatham University for the cheese and dip) and of course I attended the Keynote with Margaret Atwood (hello, Motherland! ), albeit with a very northern nosebleed seat (still good on The Big Screen). I also had a lovely time checking in with the All Collegiate Slam hosted by Wilkes University’s MA/MFA programs. Tough, tough competition there, folks. And, while not officially on the conference program, my off-site hotel was a mere two blocks from the gorgeous, stunning, amazing new Poetry Foundation building. So, I spent some quality time there admiring the walls and walls and walls of poetry books. If you haven’t stopped in yet, please do so the next time you’re in Chicago. It will blow your mind. Of all my AWP conferences to date, this one went the fastest and, frankly, almost too fast. It was over and done with before I knew it. I suppose that’s a good sign – tons of people, tons of books, and a whirlwind experience all round. Thanks to Chicago, all the hosts and sponsors, and of course all the crazy people for giving us all a good time. See you in Boston! P.S. I have more photos on Facebook, too!